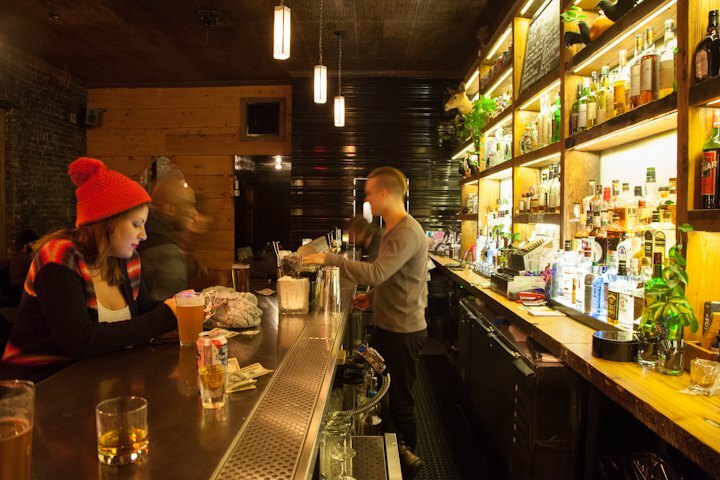 Inspired by the Spanish bar culture, Ben Warren and Gina Leone who own The Bodega, have spawned another bar called Heavy Woods. 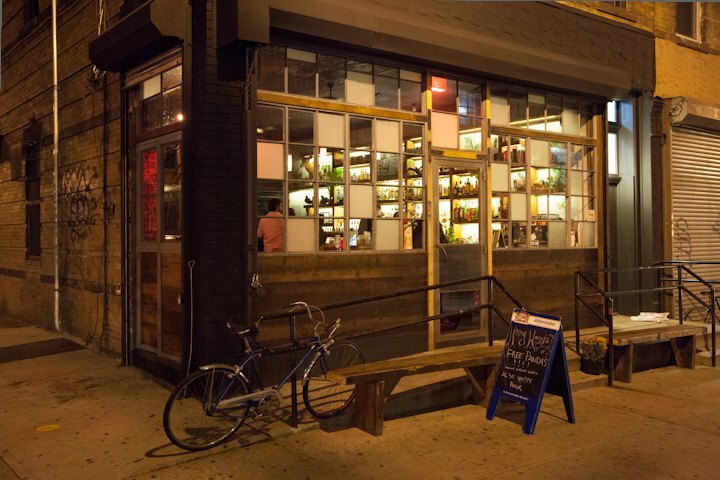 The name Heavy Woods is a play on the Dutch word, Boswijck, which later was Anglicized to Bushwick. 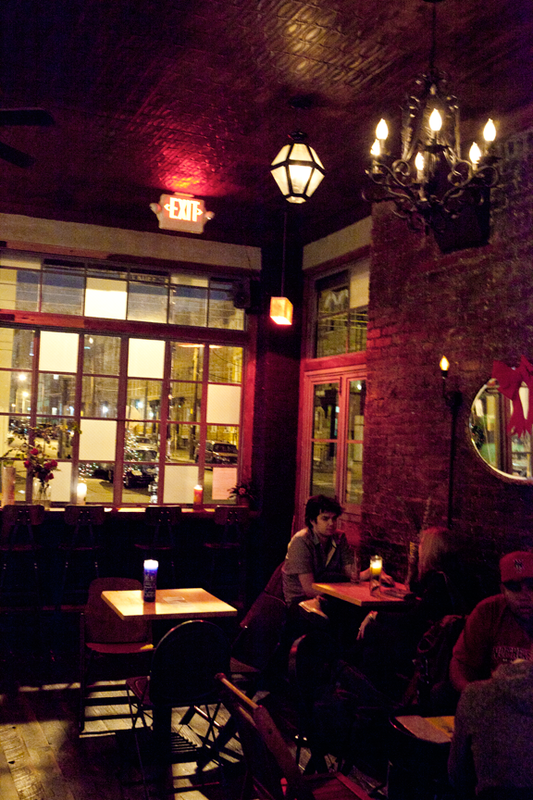 The new space serves a full bar, unlike its older sister, and as of December 2012, began to serve Chef Simon Glenn’s d.b.a popular pop-up, New Orleans style BBQ, Tchoup Shop. The food will be served from Wednesday through Sunday with expectations that it will be nightly in 2013. In addition to the food and the full bar, Heavy Woods opens up at 7:30AM to serve coffee and morning pastries for the arduous workers. Café Grumpy Bklyn provides the coffee, and the pastries are made with love from Ovenly. They serve coffee until 5PM until Heavy Woods turns into a drinkers paradise. As food lovers, we are psyched about the menu. Hot dishes like duck and okra Gumbo and crispy chicken biscuit, and bar snacks like the crab and okra hush puppies and the very adventurous pork tongue crostini. Yes, we know that we’re not being very vegetarian friendly in describing some of the food, but there are great options for you meatless eaters too. The deviled eggs, appropriately named “Awesome Devil Eggs” and Potato Mortadella Salad, are both great vegetarian options. Tchoup Shop got its name from Tchoupitoulas Street, a large and well-known street along the Mississippi River in New Orleans, which is named after an extinct American Indian tribe who settled in the area. The menu is an artisanal take on traditional New Orleans cuisine. 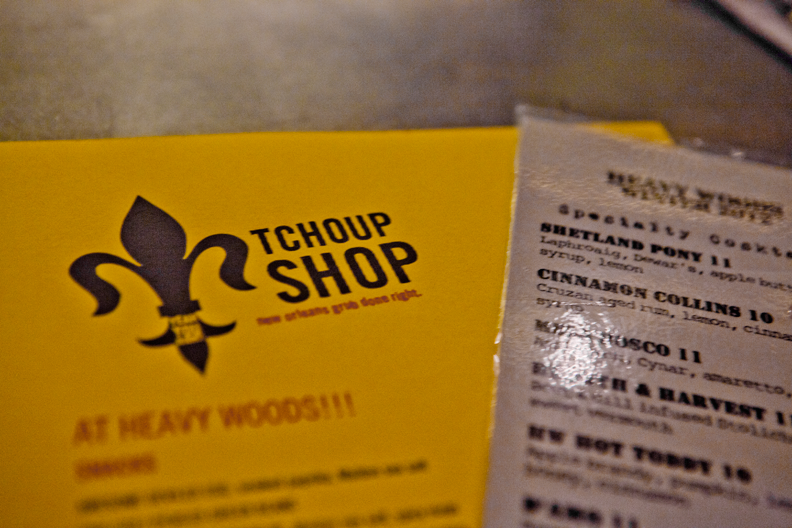 We ordered a bunch of Tchoup Shop 's “Hot Thing” specialties: Gumbo, chicken biscuit, and Po Boy Sandwich. The food was flavorful, but it lacked the New Orleans spice. With each spoonful of the gumbo you got a taste of what was inside of it. The chicken biscuit was very delicious and sweet. According to the Heavy Woods menu, it’s covered in Pepper Jelly - which I didn’t taste but it was definitely coated in something sticky and sweet (and... what's wrong with sweet and sticky?). The Catfish Po’ Boy sandwich with green onion mayo is highly recommended to try. Served on a hero, the catfish was fried to perfection and the green onion mayo was a great alternative to the traditional remoulade that normally accompanies a Po’ Boy Sandwich. If you're into tapas while drinking, you will love the "Bar Snacks." 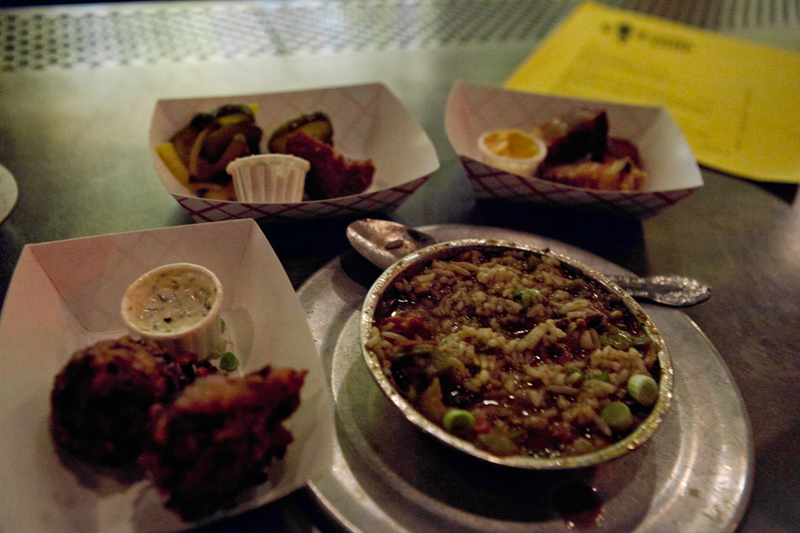 The Hush Puppies, Boudin Balls, and the Pork Cracklins are perfect for sharing. The Crab and Okra Hush Puppies had a nice jalapeño remoulade. Take your first bite of the soft puppies, and you’ll get a lump of crabmeat and a chunk of okra. Don't forget to dip it in the remoulade! The boudin balls, made of duck liver, are soft morsels of deliciousness for the adventurous eater. If you’re a fan of crispy and pork, try the Pork Cracklin’s. All of these eclectic dishes are relatively inexpensive -- the prices range from $3 to $12 per dish. If you’re not big into eating right now, we get it. It's the new year and you're on a liquid diet. The great news is that Heavy Woods has an amazing seasonal cocktails selection. The Hearth and Harvest autumn cocktail is made with beet and dill infused vodka, vermouth, and a rosemary garnish. On a cold day, try a Hot Toddy for some great buzz of a mid-winters drink. Or the Mulled Cider made with red wine and spices. Additionally, they have fourteen craft beers available. The resemblance between The Bodega and its younger sister Heavy Woods is uncanny with the great and helpful staff and amazing beers on draft. In addition, you will surely appreciate how eclectic and fearless Heavy Woods is when it comes to experimenting between countries.